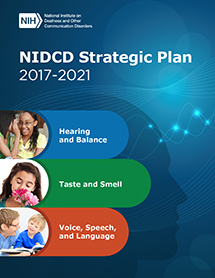 The NIDCD supports and conducts approximately 1,300 research grants, training awards, and contracts in seven areas of communication: hearing, balance, taste, smell, voice, speech, and language. These programs take place within the research laboratories and clinic at the NIH campus in Bethesda, Maryland (intramural research), or in public and private institutions and organizations across the country and around the world (extramural research). Both intramural and extramural research and training programs include the full spectrum of scientific activities including basic, clinical, and translational research. These studies answer fundamental scientific questions to prevent, screen, diagnose, and treat disorders of human communication. Selected outcomes of research supported or conducted by the NIDCD. Our extramural research program funds research and training opportunities at universities, medical centers, and other institutions throughout the United States and abroad, through research grants, career development awards, and other mechanisms. Our Division of Intramural Research conducts research and offers research training in laboratories and clinics on the NIH campus in Bethesda, Maryland. Summaries from all scientific program areas. Information for volunteers and professionals on clinical trials and observational studies.